This is a 2 bedroom 2 bathroom located on the 8th floor of the East Tower of the Sonoran Sun Resort. 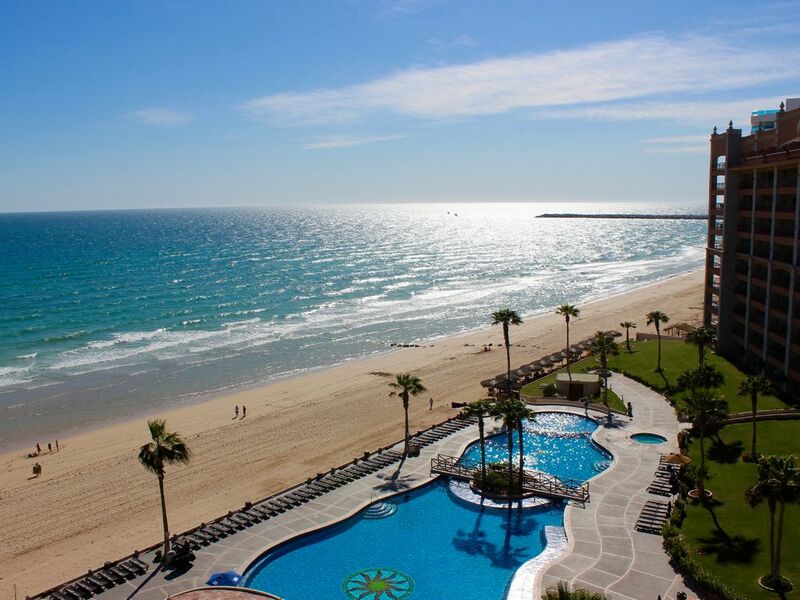 The Sonoran Sun I son of the most luxurious resorts on the popular area Sandy Beach. The resort has many fist class amenities like Restaurant and bar Emiliano´s, state of the art fitness center, ocean front swimming pools, Jacuzzis, BBQ grills (propane and charcoal), full service spa, beach palapa's, convenience store, aqua bar and tennis court. This is truly paradise! The unit capacity is for 4 persons but you can add two additional guest as this unit has a sofa sleeper on the living room. The living room has been furnished with an L shape sectional sofa with very plush pillow backs. The family area comes with end tables, coffee tables and media cabinet. The media cabinet has a TV, VCR, CD player and DVD. You can access to the balcony though the sliding doors of the master bedroom and living room. The master bedroom has a large king size bed with dark wood framed sleigh bed with cream colored bedding. The room has a dresser, a leather arm chair and bed side tables. The 2nd bedroom has a queen size wood framed bed with cream colored bedding. The room has matching bed side tables and a dresser. Both bedrooms have a two door closet with a large mirror and enough space. The unit has two bathrooms one in the master bedroom with double sinks and a walk in shower and the second one on the hall. Enjoy your evenings on your own private terrace that has a small beverage table and two lounge chairs. This place is the best to enjoy breakfast while you watch the sunrise over the Sea of Cortez. In the evenings grab a beer or a cup of wine and breath the salty ocean air, relax and hear the waves. You will not be disappointed with this property. You should check now for availability and rates. Book now! Paradise awaits you ! Loved this unit. The owners even supplied drinking water at no extra cost. This was a nice surprise since drinking water from the local system is not safe. All plastic dish and glassware was disappointing. no wine glasses. It would have been nice to drink from real glassware, especially wine glasses.